I’ve heard some comments here and there that lead me to believe that some SAR groups think they can operate a UAVs (unmanned aerial vehicles) under the Transport Canada’s exception for sub 2kg UAVs. The reality is that the conditions in this exception are very difficult to meet and are meant to define a very limited set of circumstances. The following exemptions are particularly difficult to meet and make this exception impractical at best for SAR operations. 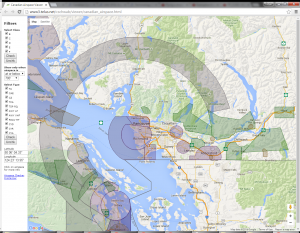 Class G air space is air space that is not categorized as categories A through F. A map of Canadian Airspace can be found here. 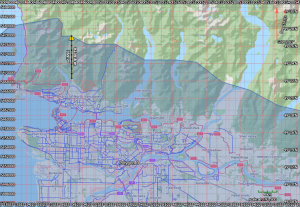 Selecting “at or below” and then “700′” just to see what airspaces are regulated at this altitude shows the huge areas around major airports, flight lanes, and even designated para-sailing areas near Grouse Mountain (to take Vancouver as an example). The entire southern portion of Vancouver Island is out, as is the area from Penticton to Kelowna to Kamloops. Condition 25: UAV must be at least 5 nautical miles (9.26 km) from an aerodrome. This includes helipads. The web site dontflyhere.ca by Joe Bowser shows what this looks like by placing 9 km circles around every Transport Canada registered aerodrome. This means that anything 9km from where the last building is located cannot be under the exception. This covers a massive area near every highway, village and building in BC. 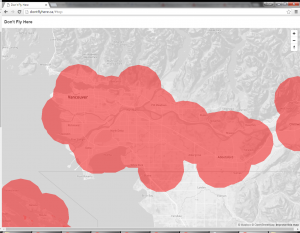 For example, it rules out the use of Drones under this exception anywhere on the North Shore, Lions Bay or in the Coquitlam area – covering the highest call volume area in BC. UAVs operated under these exemptions are not required to meet any technical airworthiness standards meaning that there is no assurance of the airworthiness or capabilities of the UAV system. This increases the risks to persons and property on the ground, therefore, UAVs must not be operated near populated areas. Built-up areas are considered areas with groups of buildings or dwellings including anything from small hamlets to major cities. Anything larger than a farmstead should be considered a built up area. Notwithstanding the 37 different conditions in the exception which include training and insurance, it’s clear that it’s not intended for anything but remote operations like mining, agriculture and forestry. My recommendation for Search and Rescue has always been to go through the Special Flight Operations Certificate. I’ve personally had this recommended to me by Transport Canada experts and others in the UAV industry to give the most utility. This opens up all sorts of uses that are just not possible through the exemption. It’s not straightforward or free which is why I’ve been recommending, at least initially, that all SAR operations consider contracting out flights to certified operators. This is also in line with EMBC’s evolving policy on the topic. Transport Canada has created a tool that encompasses the tools mentioned above. It’s called the UAV site selectorm and it makes specific mention of the three points I’ve included. 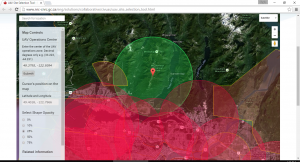 Shown above is the crowded airspace above North Vancouver including the aerodromes, airspaces A through F. The selected point is near the summit of Mount Seymour, and the green circle is a 9km radius showing that the selected point is too close to a built of area to allow flying under the exemption. I’m blown away again and again by how prevalent incorrect assumptions about the regulatory regime are. Especially within the SAR community it seems like we’ve been thinking about this topic long enough that people should at least have a basic understanding of the regulatory system.